The lull before the next big decision – the designation of the official campaign groups and the opening of the formal campaign period – continues with groups looking to maintain their profile and refine their messages. 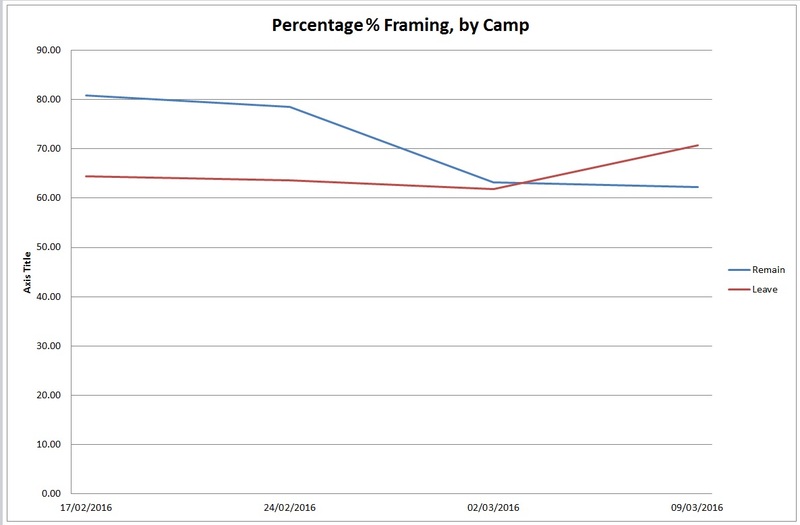 While less spectacular, this phase is still important for both sides, who have to compete to maintain relevance and interest among their voter base: in comparison to most other EU-related referendums, this is a long campaign, especially given that it has been informally fought since last May. 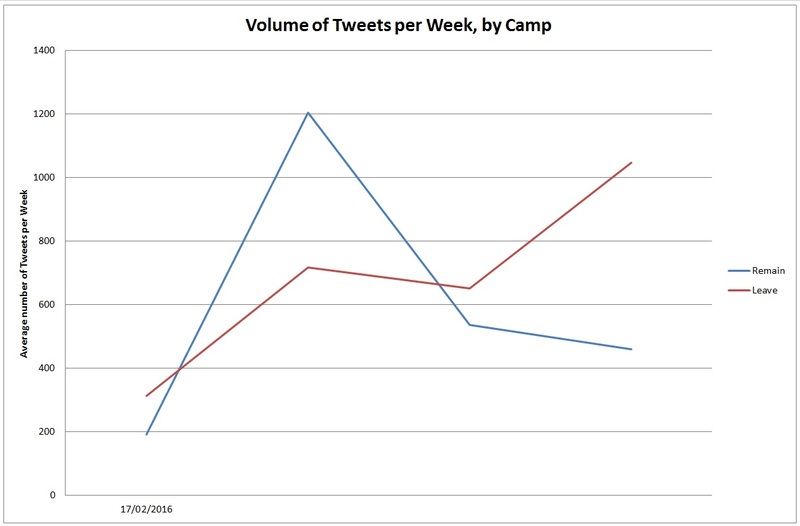 Social media activity reflects all of this. 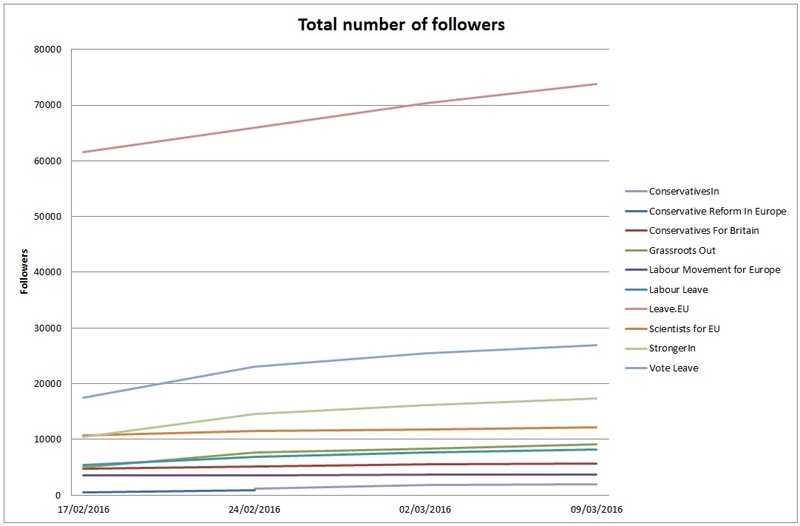 Growth in followers continues to slow (down to 5.4% this week), with larger groups showing slightly slower growth than those with fewer followers. however, there has been a push by the Leave to increase their volume of tweeting, not least in challenging Remain arguments and pushing on the case of the British Chamber of Commerce’s decision to remove its chair, john Longworth over his comments supporting Brexit. 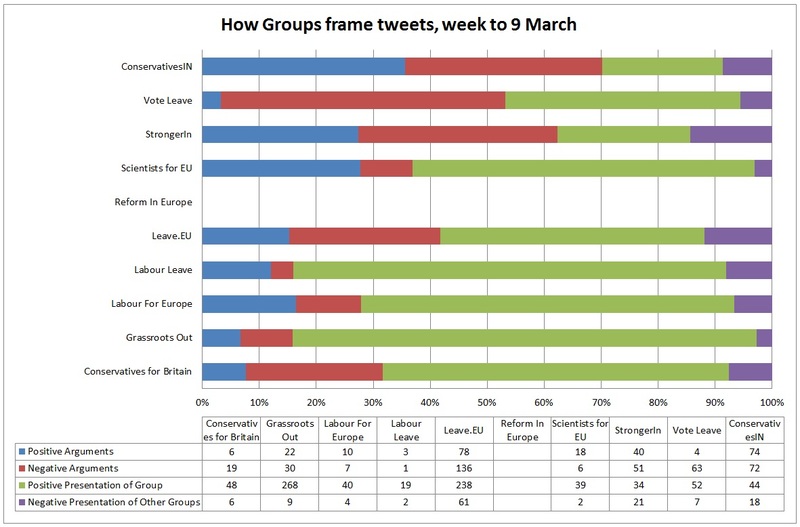 The relatively positive tone has continued, with Leave groups registering an uptick in positively-framed tweets this week (albeit mostly due to a lot of tweets about specific campaigning activity, rather than substantive content). 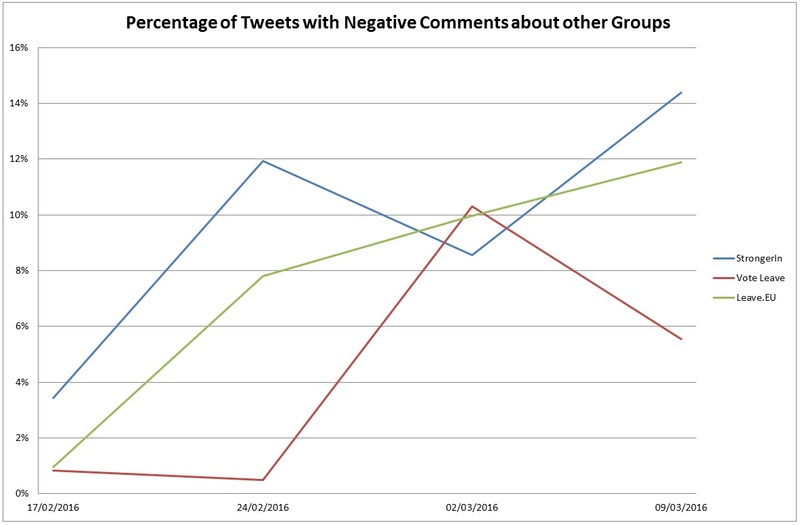 Remain have stabilised somewhat after recent drops, although as can be seen in the charts below, all three main groups have trended upwards over the past month with the volume of tweets that make negative comments about other groups. 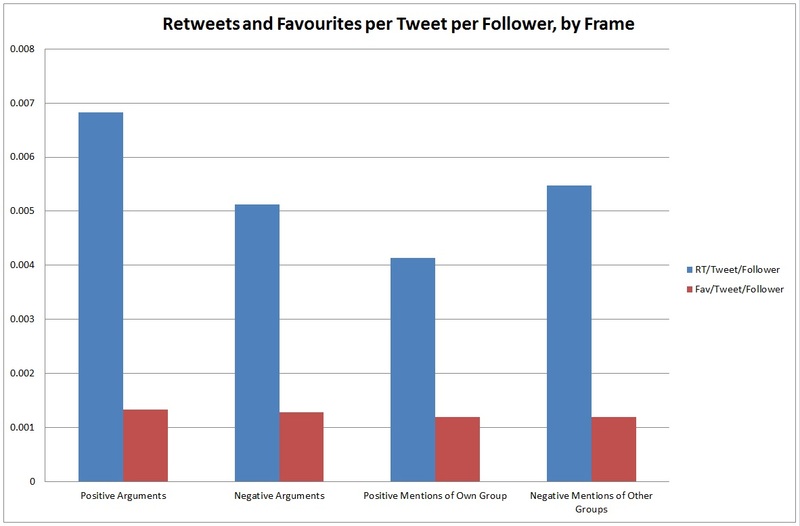 However, our analysis from last week continues to be the case, namely that positively-framed arguments get more retweets and favourites than any other category of tweets, suggesting that groups looking to get the strongest engagement with followers might benefit from a balanced approach to their content. 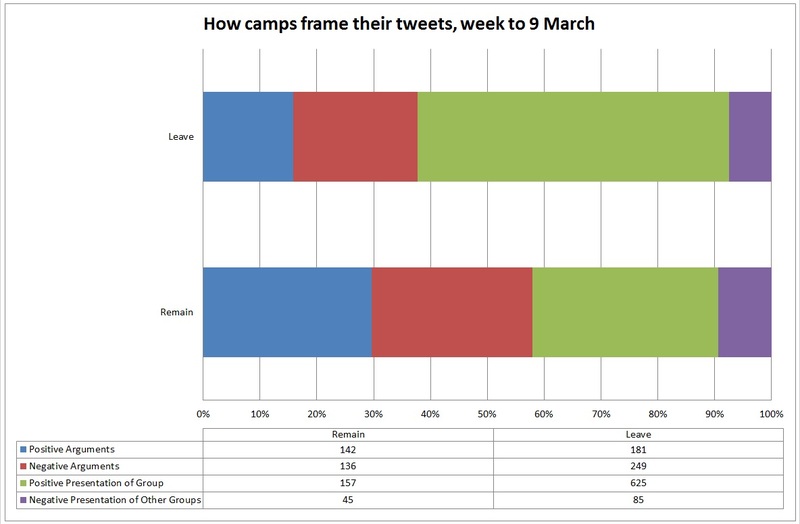 This said, we have seen the maintenance of the broad pattern to date, in terms of framing, with Remain groups making more of the case for continued membership, while Leave groups give over more space to positive tweets relating to themselves or their activities. This latter is clearly facilitated by the extent of sharing campaigning activity between Leave groups, something that has not occurred nearly so much on the other side.